This bus was only bought in an 84 capacity in 1995. But it was bought before in the smaller size (similar to the wheelchair buses below) before that time also, but they look a little different from the newer ones. 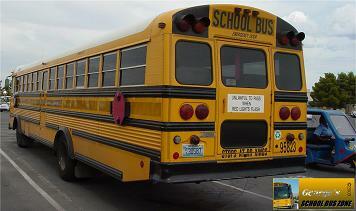 The smaller sizes were used for Special Needs students mostly. Comment: A rare find these days, a 1993 Saf-T-Liner EF. 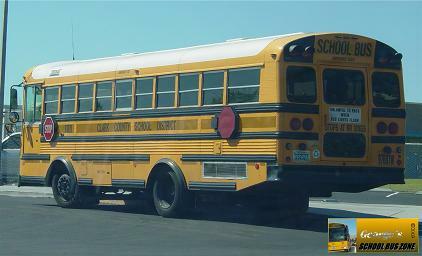 A lot of these Thomas buses from the early 90's in 1993 and 1994 had dual numbers on the side. Some would say (using this as an example) 93-513W while saying on the normal part where you see the number 93513W without the hyphen. The front grille changed in 1995 where the front logo is in near the center instead of the top of the grille. 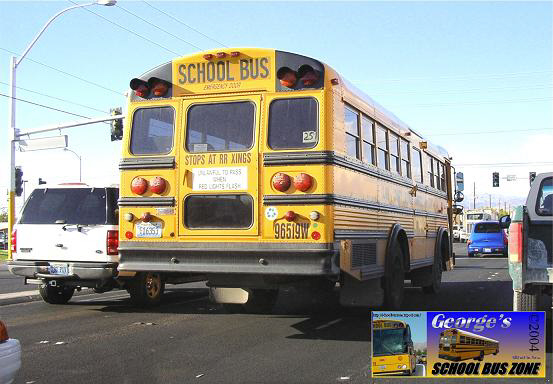 It looks like a clearance light was replaced on this bus. 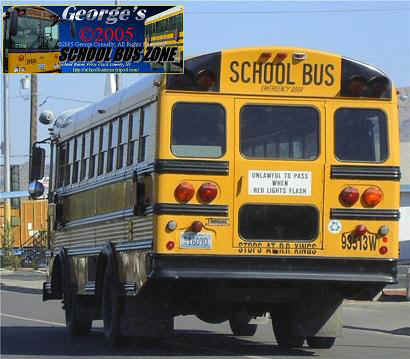 Compare this old Saf-T-Liner EF to a 2004 model they have which is over 10 years younger than this 1993. And there are no rub rails on the rear wheel chair access door. The side turn signal lights are weird shapped, they're like small half bubbles. The side turn signal on the back part is red while the one in front is orange. Comment: The rear wheelchair service door doesn't have the black rails on it. The bus is numbered twice as you can see on the right side (where it's normally put and to the left of the front wheel on the right side of the bus). Comment: This is the 84 capacity, and it was bought in that size in 1995 only. 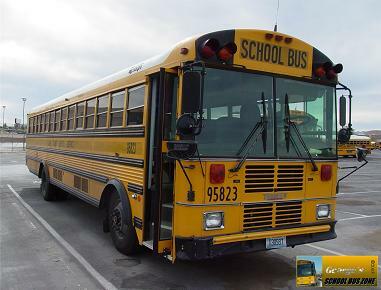 When I first rode on this model in 1995 (95802) for the first time when I was in school, I thought "wow, this bus interior and exterior looks nice," but now in 2003 it has a couple of damaged seats with gum on the floor. Physically, I think it's in pretty good condition like their other old buses. I have a couple of interior shots which I'll put up on the next update. 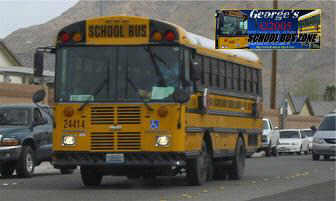 Comment: Seen heading toward the Cheyenne Bus Yard. Comment: Wheelchair lift (right side). 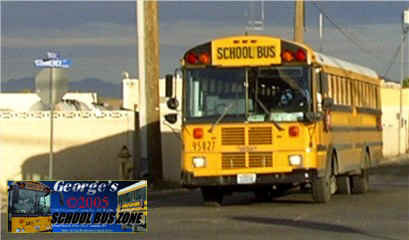 Comment: First year they used the newer stop signs on their buses. Location: Passing by Mountain View Christian School on Bonanza Road. 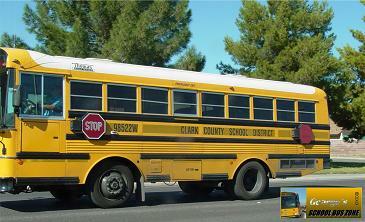 Comment: Newest bus model in the Clark County Fleet in 2004!! 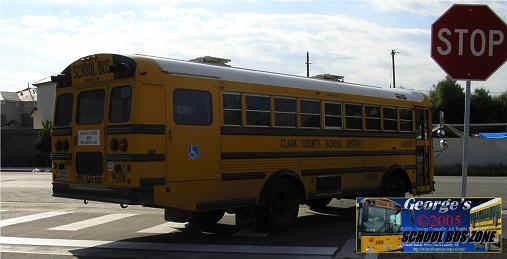 First Thomas Front Engine bus in Clark County's fleet to have the black on the windows. No biodiesel sticker, yard dot sticker, and "W" number. Did you notice the floor is completely flat from looking at the rub rail right above the wheels? Location: Washington Ave. Near Nellis Blvd. Comment: Newest and smallest Saf-T-Liner EF model currently as of 2005. Now, most of these have the crossing control arm installed. Comment: More views of the '04 Saf-T-Liner EF. Comment: Access door for wheelchairs is located in the middle part of the bus instead of in the rear like some of the others.